This is a proposal for ocean iron fertilization as a means to reduce atmospheric carbon dioxide levels. The idea is to take advantage of nanoparticulate, poorly crystalline Fe-oxides produced by chemosynthetic iron-oxidizing bacteria as an iron source to the ocean. Upon drying these oxides produce a fine powder that could be dispersed at altitude by aircraft to augment wind-driven Aeolian dust that is a primary iron source to the open ocean. Based on Fe-oxidation rates for natural populations of iron-oxidizing bacteria it is estimated 1,500 hectares of production ponds (1 × 100 × 100 m) would be required to produce sufficient iron dust to supply the 30% of the global ocean that is iron-limited. In theory, iron replete conditions will stimulate the biological pump to quantitatively remove enough carbon dioxide from the atmosphere to partially mitigate anthropogenic inputs. Modifications to existing technologies would satisfy most of the technological challenges. Addition of biogenic iron to meso-scale eddies could provide an effective means of testing this process. Nonetheless, there are many unknowns, thus any such effort will require research and development integrated across oceanographic and Earth science disciplines to determine its long term efficacy. Global emissions for the major greenhouse gas (GHG) carbon dioxide (CO2) accounted for 36.8 Gt CO2/year (2017 data) released to the atmosphere, and are projected to increase by another 2.7% in 2018 (Le Quéré et al., 2018). To limit an increase of Earth's surface temperature to <2°C by the end of the twenty-first century, the International Panel on Climate Change (IPCC) recommends that GHG emissions be reduced by 45% by 2050, with continuing reductions throughout the remainder of the twenty-first century (Moomaw et al., 2011). The large majority (>90%) of the possible scenarios outlined by IPCC to hold atmospheric CO2 to levels consistent with a ≤2°C temperature increase require some type of active removal of CO2 from the atmosphere (Fuss et al., 2014). A recent UNEP report found that to meet the 2°C requirement will require removal of an additional 12 −14 Gt of carbon from the atmosphere, primarily through CO2 removal (CDR) technologies (UNEP, 2016). This assumption is tied to the aggressive scenario of world-wide emissions reduction in global GHG emissions recommended by the IPCC. Thus, to keep anthropogenic driven global temperature increase below 2°C by 2100 will require CDR technologies be put in place within the next 10–20 years, and maintained at a substantial level during the remainder of this century. There are a number of negative emissions technologies (NETs) relevant to CDR. Relatively straightforward approaches embody enhancement of natural carbon removal processes such as reforestation, afforestation, and improved agricultural practices (Moomaw et al., 2011). More technical solutions involve industrial-scale sequestration of CO2, either at point sources, such as fossil-fuel burning power plants, or through direct air capture (Boot-Handford et al., 2014). The captured CO2 would then be stored underground and effectively removed from the climate system. One of the most discussed enhancement techniques for CDR involves addition of iron to the open ocean, referred to as ocean iron fertilization (OIF) (Martin et al., 1990). A significant body of research has shown that iron is the primary limiting nutrient for photosynthetically driven primary production in between 30 and 40% of the open ocean (Martin and Gordon, 1988; Fung et al., 2000; Raiswell and Canfield, 2011; Moore et al., 2013). These regions are often referred to as high nitrate low chlorophyll (HNLC) regions. The basic premise of OIF is that addition of iron to the photic zone of HNLC regions corresponding to the times when phytoplankton are actively growing, or blooming, will stimulate primary production. This, in turn, enhances that part of the biological pump responsible for sequestration of organic carbon (newly fixed CO2) into the deep ocean where it is removed from Earth's carbon cycle on millennial timescales (Ducklow and Steinberg, 2001; Tagliabue et al., 2017). The result is a net draw-down of atmospheric CO2. A number of studies have looked at past cycles of CO2 build-up and draw down in the atmosphere, and used different proxies to show changes in levels of iron in the surface ocean have influenced global climate (Martínez-Garcia et al., 2009; Ziegler et al., 2013; Albani et al., 2016). This basic knowledge that large regions of the open ocean are iron-limited, and that delivery of iron to the ocean has impacted past climate regimens led to a dozen meso-scale iron-addition experiments between 1993 and 2005. These were conducted in different areas of the ocean to better understand the response of the marine ecosystem to iron fertilization (Boyd et al., 2007). The goals of these experiments were to investigate the short-term effects on primary productivity, ecosystem dynamics, and stimulation of the carbon pump that transfers photic-zone derived carbon to the deep ocean. In all cases, iron fertilization led to phytoplankton blooms confirming the potency of iron as a limiting micro-nutrient. The outcome of net export of C to the depths was more ambiguous with at least one study showing significant export (Smetacek et al., 2012), but others yielding more varied results (Boyd et al., 2007; Yoon et al., 2018). The timing of fertilization efforts, the duration of the experiments both in terms of iron addition and monitoring efforts, as well as the ultimate fate of the iron, are among the factors that likely effected the net export outcomes of these experiments. For a comprehensive analysis of previous OIF efforts, see Yoon et al. (2018). Unintended consequences of these experiments include alteration of the population structure of the phytoplankton community, including the production of toxin-producing phytoplankton (Trick et al., 2010). These experiments all supplied iron as a concentrated solution of acidified ferrous sulfate (Fe2SO4. 7H2O) fed directly into the water from the fantail of a ship over the period of a few days. As such, they are not representative of natural processes whereby iron is delivered to the ocean. The mineralogical fate of ferrous sulfate is also not well documented in these experiments, but based on simple environmental kinetics of Fe(II) in oxygenated seawater at pH 8.1, presumably it oxidizes within minutes to a ferric oxide. This would likely become bound to an organic ligand (Hunter and Boyd, 2007). It is likely this iron-ligand complex that is bio-available to phytoplankton. A primary natural mechanism for delivery of iron to the open ocean is via airborne dust that is swept off the continents and into the upper atmosphere where it then settles to the sea surface (Jickells, 2005; Moore and Braucher, 2008). Aeolian dust can be transported within a few days or weeks over large areas of the ocean surface making an efficient means of distributing iron to iron-deficient regions. However, there are other factors that reduce the efficacy of Aeolian dust as a means of iron distribution. First, most of the iron is in the form of refractory crystalline iron oxide minerals that significantly reduce the bioavailability of iron to phytoplankton. Second, production of Aeolian dust is dependent upon continental geography (Moore et al., 2001; Schroth et al., 2009). This is one reason why the Southern Ocean is especially iron-limited, since there are fewer associated land masses to act as a dust source. Third, the timing and magnitude of the meteorological conditions that lead to dust generation and dispersal are stochastic, and not necessarily coupled to when iron availability may be most crucial to support primary productivity. An effective means to achieve OIF would be to augment the process of wind-driven dispersal through addition of iron dust directly to the atmosphere in such a way that it is carried long distances across the ocean. For this to be an effective strategy, the form of iron dust should be a relatively stable, poorly crystalline nanophase oxide that is bioavailable, and has a sufficiently long residence time in the photic zone to increase the probability of contact time with phytoplankton. The iron oxides produced by certain groups of lithotrophic Fe-oxidizing bacteria (FeOB) fit these criteria. A number of FeOB produce a poorly crystalline 2-line ferrihydrite iron oxyhydroxide that is extruded as filaments of nano-fibrillar oxides as a consequence of their growth (Chan et al., 2009, 2010), Figure 1. The organic component of these oxides is believed to be a polysaccharide excreted by the cells that likely plays an initial role in templating the development of the oxide structure. The biogenic oxides also readily adsorb organic matter from their environment (Bennett et al., 2014). Biogenic oxides are more resistant to undergoing further diagenesis to more crystalline forms of iron-oxides, compared to chemically synthesized ferrihydrite (Toner et al., 2012; Picard et al., 2015). The adsorption and incorporation of organic matter into biogenic ferrihydrite can enhance its hydrophilicity, and these oxides are often referred to as hydrous ferric oxides (Fortin and Langley, 2005). The end result is a filamentous oxide composed of nanophase substituents that has a large surface area, is resistant to further crystallization, and its hydrous nature should reduce its rate of sinking out of the photic zone. Because the starting material is nano-particulate oxides, when biogenic iron mat is dried down and subjected to simple grinding, a fine powder results that produces dust (Supplemental Video 1). Figure 1. 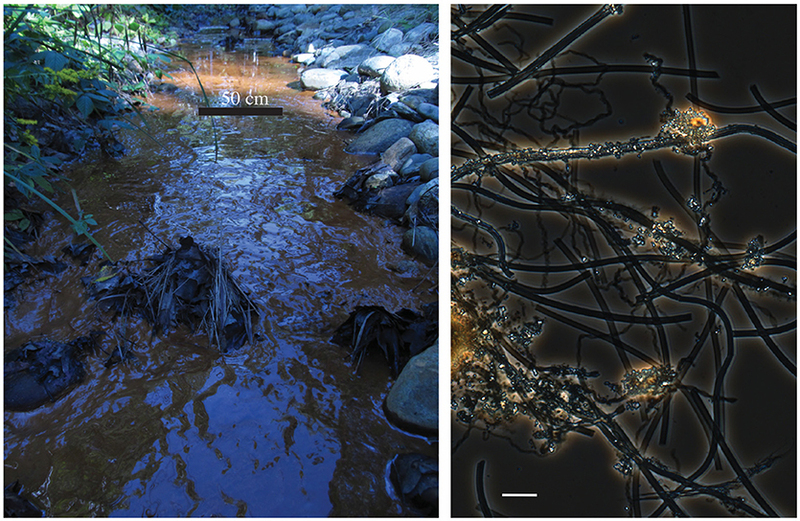 The left panel shows a microbial iron mat forming in a ditch fed naturally by Fe(II)-rich water. This mat is 10–20 cm deep, and its age is ~3 weeks. The right panel is a photomicrograph showing FeOB taken from the same iron mat. Two common morphotypes of poorly crystalline iron oxyhydroxides are evident, long hollow tubular filaments produced by Leptothrix ochracea, and helical ribbons produced by Gallionella spp. The marker bar = 5 μm. A key question concerns the amount of iron dust that would be required to induce draw down of CO2 from the atmosphere. Iron concentrations in the photic zone of the open ocean are typically in the range of 0.5–1 nM (Misumi et al., 2014). It is estimated that the Atlantic ocean downwind of the Sahara desert receives around 0.027 g of Aeolian dust per m2 per day (Anderson et al., 2016). The total iron concentration of Saharan dust is around 3.5% by weight (Jickells, 2005). Iron concentrations in this region of the Atlantic are generally considered replete, or at least non-limiting for primary production. If used as an upper boundary, this provides a conservative estimate of how much iron-derived dust would be required to fertilize the third of global ocean that is iron-limited. 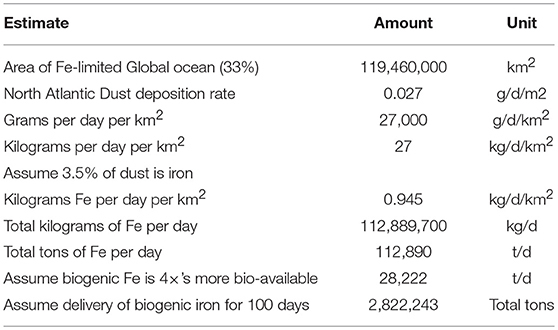 Table 1 provides an estimate of how much iron dust would need to be provided to the global ocean based on this assumption. Further assumptions are that iron dust would only need to be delivered 100 days per year. This is because delivery would be most effective if done coordinately with when phytoplankton blooms are likely. In addition, the residence time of hydrous iron oxides in the ocean's photic zone should buffer the need for constant delivery. A third variable is the bioavailability of biogenic oxides. Poorly crystalline ferrihydrite is dominant mineral form of biogenic iron oxides, while Aeolian iron dust is comprised primarily of the more crystalline iron-oxides goethite and hematite. These latter minerals have relatively low bio-availability compared to ferrihydrite (Wells, 1989; Rich and Morel, 1990). Furthermore, most bioavailability studies have utilized ferrihydrite synthesized in the laboratory, which has different properties compared to biogenically produced ferrihydrite (Emerson, 2009; Sowers et al., 2017). Preliminary experiments done in the authors laboratory have compared growth of a marine diatom under iron-limiting conditions using environmental biogenic iron oxides produced predominately by the freshwater iron-oxidizer Leptothrix ochracea (Figure 1) with abiotic or chemically synthesized ferrihydrite. The addition of biogenic oxides resulted in growth yields of ~60% compared to cultures grown in iron replete conditions, while growth yields with abiotic ferrihydrite were only about 15% of replete conditions, indicating biogenic iron oxides are readily available to at least one diatom species. Based on this information, a somewhat arbitrary estimate of biogenic iron oxides being at least four times as bioavailable as the crystalline oxides found in dust was used in the estimates shown in Table 1. In total, this estimate concludes that ~2.8 million tons of biogenic iron oxides would be delivered over 100 days per year to the iron-limited regions of the global ocean to reach conditions where iron was not limiting primary productivity. Table 1. Estimate of iron requirement for annual OIF of one-third of the open ocean, based on total global ocean area of 361,900,000 km2 (source, NOAA). The FeOB naturally responsible for production of biogenic iron oxides were first described in the first half of the nineteenth century, and the general conditions that promote their growth were well-documented a century ago (Harder, 1919). FeOB grow best under a continuous flux of Fe(II) and O2, where Fe(II) concentrations may range from tens to hundreds of μM, while O2 concentrations are typically in the tens of μM. Natural iron seeps that stimulate the growth of FeOB are common, and share in common a supply of anoxic Fe(II)-rich water mingling with oxygenated water (Kappler et al., 2016, Figure 1). From an engineering perspective, a number of strategies could be employed to promote conditions for the growth of FeOB relevant to the application proposed here. For simplicity, a scenario for large scale production of biogenic iron oxides will be considered that would use 100 m2 pools (either entirely earthen or constructed from concrete), no more than a meter deep, and set at a shallow angle so anoxic Fe(II)-rich water would be fed into them, and slowly flow by gravity through the catchment. Gentle aeration would be provided to obtain the right mix of O2 and Fe(II) to stimulate the growth of filamentous FeOB. Following the growth phase the pools would be drained and the oxides recovered and dried, and the pool re-used for another growth cycle. Simply leaving a residue of oxides in the system after harvest would provide inoculum for succeeding rounds of growth. Table 2 presents a calculation of the amount of Fe-oxides that could be produced over a 30-day growth cycle. This is based on a cellular Fe-oxide production rate calculated from growth of a naturally occurring population of the sheath-forming freshwater Fe-oxidizer Leptothrix ochracea (Emerson and Revsbech, 1994). 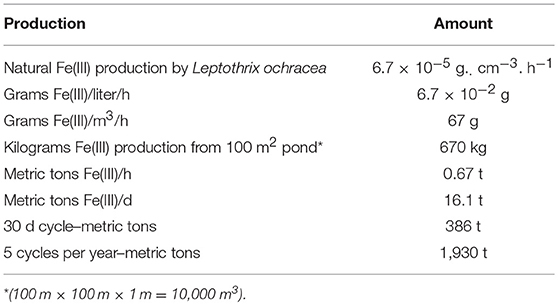 If it is assumed an individual pond could produce five, 30 day growth cycles per year of biogenic iron oxides, this would yield 1,930 tons of biogenic Fe oxides/year/pond. Based on this scenario, it would require ~1,460 one hectare ponds to adequately supply to a third of the world's ocean, from Table 1. Table 2. Production estimate for biogenic iron oxides. There are a number of possible Fe(II) sources that could be used to support large-scale growth of FeOB. Naturally occurring chalybeate groundwaters with a pH between 5.5 and 7 are common in many parts of the world, and are an attractive source of Fe(II), since the primary associated cost is pumping water up from an aquifer. In fact, the removal of iron from groundwater is a major undertaking for utilities or companies that supply water for domestic or industrial use (Emerson and de Vet, 2015); thus there exist large scale engineering technologies for Fe(II) removal, some of which could be adapted for the purposes proposed here. Another possibility is to use acid mine waters with high Fe(II) concentrations, which can often be in the mM range (Johnson and Hallberg, 2005). These waters would need to undergo some neutralization prior to use, but their use would have the benefit of helping to ameliorate a legacy environmental problem. It would also be possible to engineer soil columns that either contain iron mineral rich soil, or that are artificially enriched with zero valent iron (ZVI) or another mineral iron source. If water was percolated through these with the addition of some organic matter to stimulate natural populations of Fe-reducing bacteria, this could also be a large scale source of Fe(II). Because the natural microbial communities that would live within the production ponds are highly adapted to the requirements for growing on Fe(II), issues related to contamination and predation that are often detrimental to large scale bioprocesses are not expected to be significant. The use of freshwater Fe-oxidizing communities would alleviate concerns about adding “foreign” bacteria to the ocean, since the inhabitants of freshwater Fe-oxidizing communities are not known to live in full strength seawater (McBeth et al., 2013), nor would the total Fe concentrations in seawater that are in the low nanomolar range support their growth in the open ocean. How iron dust is delivered to the atmosphere is a crucial aspect of this proposal. To mimic Aeolian dust will require dispersion of iron dust at high enough altitudes to take advantage of wind patterns that maximize distribution over the ocean. There are well developed technologies for the delivery of dry chemicals (fertilizers and control agents) via aircraft for agricultural purposes. For agricultural spraying done at low altitudes (crop dusting) the requirements are to maximize coverage of particles, while reducing drift; however for dust distribution, the goal will be maximize drift. Research has shown particle sizes in the 50–100 μm range are optimal for many crop dusting applications (Craig et al., 2014). Wind-borne Aeolian dust particles from sub-Saharan Africa show a significant size range from <10 μm to >200 μm; however the majority of dust particles are in the 10–50 size range (Stuut, 2005), thus below the optimal size for crop-dusting. To achieve delivery of finer dust particulates will likely require some refinement of existing technologies. Agricultural aircraft typically disperse dry materials using ram-air spreaders (Matthews et al., 2014). These consist of a series of thin curved ducts fed by a hopper that result in a thin, sheet-like layer of particles of variable dimensions spread behind the aircraft. The most controlled means for delivery of materials via aircraft is through the use of rotary atomizers that create a spray or mist of wet chemicals. Rotary atomizers are capable of producing droplet sizes below 10 μm (Craig et al., 2014). Research will be required to determine if distribution of iron dust purely as a powder, or as a slurry that can be atomized is the best option. In terms of effective altitudes for dispersion of biogenic oxides, the upper reaches of polar (12 km) and subtropical (16 km) jet streams are within the operational range of modern aircraft, although conventional crop-dusters are not designed to operate at upper bounds of these altitudes. Temperatures well below 0°C at the higher altitudes would also need to be factored in to development of effective dispersal technologies used at high altitude. Alternatively, low altitude, more focused applications could be done from helicopter's operating directly from ships. Agricultural helicopters operating from a single ship would be capable of delivering iron dust at altitudes of up to several thousand meters and covering hundreds or thousands of square kilometers of ocean per day. The logistics of where, how long, and at the specific altitudes that application of iron dust would need to take place, as well as the number of aircraft (both manned and unmanned) will be dependent on detailed atmospheric and oceanographic modeling. These estimates are largely beyond the scope of this proposal. One intriguing possibility for delivery testing of this idea would be to seed meso-scale eddies that traverse HNLC oceanic regions. Meso-scale eddies are known to impart control on trace nutrients in oligotrophic ocean waters (McGillicuddy et al., 1998; Twining et al., 2010). For example, meso-scale Haida eddies in the Gulf of Alaska play a role in transport of dissolved Fe from the coastal zone into iron-limited regions of the North Pacific (Johnson et al., 2005). An in-situ mesoscale iron fertilization experiment in the eastern sub-Arctic Pacific (SERIES) supplied iron to a Haida eddy, and induced a diatom-dominated phytoplankton bloom that was tracked for days within the eddy (Boyd et al., 2004). Furthermore, the most successful OIF experiment in terms of demonstrating carbon export was conducted on a meso-scale eddy in the Southern Ocean (Smetacek et al., 2012). Controlled aerial delivery of biogenic iron dust to an eddy system could provide a meso-scale demonstration of the effectiveness of iron fertilization, as proposed here. Furthermore, it should be possible to deliver iron, either as acidified ferrous sulfate, or in some other form, directly from a ship to a spatiotemporal contemporaneous eddy to one that is fertilized by biogenic iron dust to compare the effects of biogenic iron to other forms of iron addition. In theory, larger scale, controlled fertilization of eddy systems could provide a means to test the overall effectiveness of iron fertilization as a means of actual draw down of CO2 from the atmosphere. The approach outlined here would rely on the adaptation and re-purposing of a variety of existing technologies. Thus, it is unlikely there would be any major technological impediments for this plan. It's possible unforeseen technical details could work in antagonistic ways that would reduce its effectiveness and/or increase costs to prohibitive levels, alternatively there could be presently unrecognized positive synergies that improve the effectiveness. Clearly, there would be need to years of research and development relevant to all aspects of such a project, from production of biogenic oxides, processing of oxides for delivery, mode of delivery, and understanding their bioavailability following atmospheric exposure. Coupled with this would be an integrated understanding of atmospheric circulation patterns, oceanic currents, and phytoplankton dynamics to make the most effective applications possible. The most concerning aspects of any OIF program are 2-fold. One, the long-term detrimental ecosystem effects that could outweigh any advantage of a reduction in atmospheric CO2 levels. Previous short-term meso-scale iron addition experiments using ferrous sulfate have noted changes in the phytoplankton composition of fertilized regions with a trend toward larger diatoms (Boyd et al., 2017). The larger implications of these community shifts to overall ecosystem function would need to be carefully monitored and evaluated for any longer term fertilization efforts. Second, the overall effectiveness of iron fertilization in terms of net carbon removal via the biological pump is less than expected (Zahariev et al., 2008). On the other hand, biogenic iron fertilization could have complementary effects on other aspects of nutrient limitation that ultimately affect the biological pump responsible for transport of carbon to the deep sea. It is known that Fe-limitation plays an important role in the capacity of diazotrophic cyanobacteria, for example Trichodesmium, to fix N2 in the oligotrophic ocean (Walworth et al., 2018). Understanding how biogenic iron might affect diazotropy would be another area of useful research. Two other important limiting nutrients in the open ocean are phosphorus and vitamins (Koch et al., 2011). It is unlikely the bacterial load associated with biogenic iron dust would provide appreciable sources of either P or vitamins; however, biogenic iron oxides strongly adsorb both P and organic matter (Bennett et al., 2014; Smolders et al., 2017). Supplementing biogenic iron oxides with either of these micro-nutrients could provide an additional means of delivering them at low dosage, together with iron. To better understand the overall efficacy of biogenic OIF, an extensive campaign of laboratory testing and limited field trials centered around the bioavailability, and reactivity of biogenic oxides in both the atmosphere (during dispersal) and the photic water column is needed. These would need to be coupled to modeling efforts, as well as long-term monitoring campaigns to assess actual carbon removal rates via OIF. Perhaps the highest immediate priority is to achieve a better understanding of the biological pump in the open ocean (Burd et al., 2016). In addition to the technical and scientific challenges, there are important legal considerations for OIF or any large scale strategy for mitigation of climate change that must be addressed. Specific to OIF, the applicable legal framework is London Protocol adopted in 1996 that placed legal restrictions on ocean dumping. The London Protocol was an amendment to the convention on prevention of marine pollution and dumping of wastes and other matter into the ocean (originally adopted in 1972). With regard to OIF, the London Protocol was amended in 2013 to regulate marine geoengineering activities with the aim of controlling, and, in effect banning, unregulated commercial activities aimed at marine geoengineering. The amendment was done largely in response to the establishment of commercial ventures that intended to exploit OIF to obtain carbon credits, see Yoon et al. (2018) and Scott (2019) for a more detailed discussion of these issues. The amendment does not prohibit research on OIF or other geoengineering approaches; however, it's guidelines are either restrictive, or ambiguous enough, that experimentation on OIF has effectively stopped (Yoon et al., 2018; Scott, 2019). Given the fact that GHG emissions to the atmosphere continue to increase, despite global action to mitigate emissions (Le Quéré et al., 2018), there is debate about re-visiting legal frameworks for NET applications in the marine realm (Brent et al., 2018). Suffice it to say that the field trials to application phases of any geoengineering effort will need to be undertaken within established international legal norms. It is beyond the scope of this article to provide a detailed estimate of how much CO2 could potentially be removed from the atmosphere using a dust-borne OIF approach; however, paleo-estimates of CO2 reduction as a result of dust-borne iron fertilization are on the order of 50–80 ppm, from an atmosphere with at least 120 ppm less CO2 than is presently in the atmosphere (Martínez-García et al., 2014; Tagliabue et al., 2017). Another sign of the potential effectiveness of iron addition comes from the anomalous leveling off of CO2 build-up in the atmosphere in 1992 following the eruption of Mt Pinatubo in 1991. It is estimated that this major volcanic eruption may have released 4 × 1010 grams of iron into the atmosphere, a portion of which was then deposited over the Southern Ocean (Watson, 1997). One scenario suggests this led to an oceanic iron fertilization event that resulted in phytoplankton blooms that fueled additional sequestration of carbon by the biological pump and net removal of CO2 from the atmosphere (Sarmiento, 1993; Duggen et al., 2010). Unfortunately, at the time, there were no orbiting satellites capable of making space-based measurements of ocean chlorophyll, so direct evidence for volcanic release of iron being the source of an iron fertilization event remains speculative. A better documented example of volcanic iron deposition occurred in the subarctic northeast Pacific Ocean, where a significant plankton bloom was observed following an eruption of an Aleutian Island volcano (Hamme et al., 2010). Finally, Oeste et al. have proposed adding iron salts to the flue gases of hydrocarbon burning power plants as a way to distribute iron salts to the atmosphere (Oeste et al., 2017); these authors conclude such a scheme could lead to CO2 draw down through processes not dissimilar to what is proposed here. At this point, it is not possible to put a timeline on the process of augmenting the wind with iron dust, or assign a monetary cost. Because of the relatively benign technological requirements for dust production and distribution, it is reasonable to assume these would be at the lower end of the implementation and cost spectrum of any geoengineering program aimed at mitigating global warming and climate change. I thank SaraBeth George for conducting laboratory experiments on bioavailability of biogenic iron oxides, and Dr. Ben Twining for his advice and comments. I thank Dr. Steve Archer, and Dr. Dan Ohnemus for helpful comments on an earlier draft of this manuscript, and Mr. Gene Kritter for sharing his expertise on the use of agricultural aircraft. Supplemental Video 1. This video shows the fine dust that can result from dried iron mat. Approximately 100 g wet wt of the iron mat from the ditch show in Figure 1 was air dried and ground for 1 min with a mortar and pestle, and placed in the bottle. The bottle was hand shaken for 15 s. just prior to the lid being removed. Emerson, D., and Revsbech (1994). Investigation of an iron-oxidizing microbial mat community located near aarhus, denmark: laboratory studies. Appl. Environ. Microbiol. 60, 4032–4038. Harder, E. C. (1919). Iron-Depositing Bacteria and Their Geological Relations. Washington, DC: US Geological Survey. 113, 7–89. Jickells, T. D. (2005). Global iron connections between desert dust, ocean biogeochemistry, and climate. Science 308, 67–71. doi: 10.1126/science.1105959. Johnson, D. B., and Hallberg, K. B. (2005). Acid mine drainage remediation options: a review. Sci. Total Environ. 338, 3–14. doi: 10.1016/j.scitotenv.2004.09.002. Kappler, A., Emerson, D., Gralnick, J. A., Roden, E. E., and Muehe, E. M. (2016). “Geomicrobiology of iron,” in Ehrlichs Geomicrobiology, eds H. L. Ehrlich, D. K. Newman, and A. Kappler (Boca Raton, FL: CRC Press), 343–399. Le Quéré, C., Andrew, R. M., Friedlingstein, P., Sitch, S., Hauck, J., Pongratz, J., et al. (2018). Global carbon budget 2018. Earth Syst. Sci. Data 10, 2141–2194. doi: 10.5194/essd-10-2141-2018. Martin, J. H., Gordon, M., and Fitzwater, S. E. (1990). Iron in Antarctic waters. Nature 345, 156–158. Martin, J. H., and Gordon, R. M. (1988). Northeast Pacific iron distributions in relation to phytoplankton productivity. Deep Sea Res. 35, 177–196. doi: 10.1016/0198-0149(88)90035-0. Martínez-García, A., Sigman, D. M., Ren, H., Anderson, R. F., Straub, M., Hodell, D. A., et al. (2014). Iron fertilization of the subantarctic ocean during the last ice age. Science 343, 1347–1350. doi: 10.1126/science.1246848. Matthews, G. A., Baatman, P., and Miller, P. (2014). Pesticide Application Methods. 4th Edn. Hoboken, NJ: Wiley Blackwell. McBeth, J. M., Fleming, E. J., and Emerson, D. (2013). The transition from freshwater to marine iron-oxidizing bacterial lineages along a salinity gradient on the Sheepscot River, Maine, USA. Environ. Microbiol. Rep. 5, 453–463. doi: 10.1111/1758-2229.12033. McGillicuddy, D. J. Jr., Robinson, A. R., Siegel, Jannasch, H. W., Johnson, R., Dickey, T. D., McNeil, J. et al. (1998). Influence of mesoscale eddies on new production in the Sargasso Sea. Nature 394, 263–266. Misumi, K., Lindsay, K., Moore, J. K., Doney, S. C., Bryan, F. O., Tsumune, D., et al. (2014). The iron budget in ocean surface waters in the 20th and 21st centuries: projections by the community earth system model version 1. Biogeosciences 11, 33–55 doi: 10.5194/bg-11-22-2014. Moomaw, W., Yamba, F., Kamimoto, M., Maurice, L., Nyboer, J., Urama, K., et al. (2011). “Introduction,” in IPCC Special Report on Renewable Energy Sources and Climate Change Mitigation, eds O. Edenhofer, R. Pichs-Madruga, Y. Sokona, K. Seyboth, P. Matschoss, S. Kadner, et al. (Cambridge, UK; New York, NY: Cambridge University Press), 161–206. Scott, K. N. (2019). “Mind the Gap: Marine geoengineering and the Law of the Sea,” in High Seas Governance: Gaps and Challenges, eds R. C. Beckman, M. McCreath, J. A. Roach, and Z. Sun (Leiden: Brill Nijhoff), 34–56. Stuut, J.-B. (2005). Provenance of present-day eolian dust collected off NW Africa. J. Geophys. Res. 110, 867–814. doi: 10.1029/2004JD005161. UNEP (2016). The Emissions. Gap Report 2016. Copyright © 2019 Emerson. This is an open-access article distributed under the terms of the Creative Commons Attribution License (CC BY). The use, distribution or reproduction in other forums is permitted, provided the original author(s) and the copyright owner(s) are credited and that the original publication in this journal is cited, in accordance with accepted academic practice. No use, distribution or reproduction is permitted which does not comply with these terms.